As your local professional landscaper in Phoenix, we have experiencing in the landscaping business going back to 1986. When it comes to finding a landscaper in Phoenix, homeowners want a solution that meets their needs. We work with you to identify your ideals, habits, and style to create landscaping that is as functional as it is beautifully suited to your unique flair. Our skilled landscapers work with lush grass, artificial turf, desertscaping, fire features, retaining walls, shade structures, outdoor kitchens, and more. 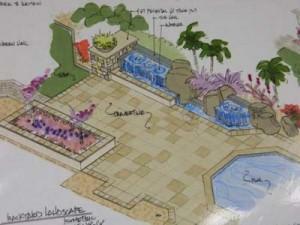 We are an experienced contractor that can handle the limitless possibilities available for Phoenix landscaping. Make it happen with MasterAZscapes LLC. At MasterAZscapes we believe in communication. That starts with listening and continues through our transparent pricing. We make sure we understand your needs. We give you a realistic time frame and a written cost estimate. Why take a gamble on the finished product with another company when we’ll put it in writing? Our business was built on integrity and honesty. Our entire staff is committed to dependability, quality, and customer satisfaction. There is a reason so many of our customers insist on sticking with us—and they tell their friends! Check out our A+ rating with the Better Business Bureau and our excellent reviews on Angie’s List. We have over 50 reviews on HomeAdviser and an excellent rating as well as a Screened and Approved Badge. We finish on time and on budget. We deliver excellent customer care, knowledgeable, skilled landscaping and building, top-of-the-line products, and a team who truly cares about the work we provide. We back all of our work with material and workmanship warranties! We guarantee you satisfaction, for your peace of mind. 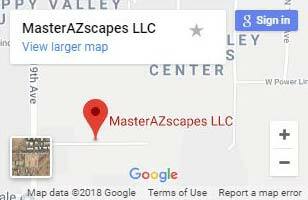 At MasterAZscapes we have all your landscaper Phoenix needs covered. We personalize each job according to your specific space, budget, and vision. We can help you carry out your vision for an outdoor space or tailor additional features to match your existing plan. Each space is unique and we want you to feel your home or business is landscaped to perfection. Having an outdoor space worth spending time in is almost like adding on a new room. You suddenly have all this extra space to enjoy. 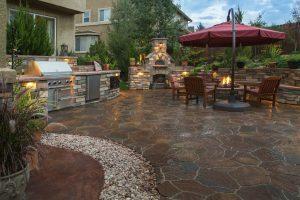 Landscape additions such as a fire place, an outdoor kitchen, and pavers create both ambiance as well as functionality. Our landscape designers listen to your heart’s desire. Whether you need extra space for exercise equipment, a yoga or meditation spot, or more room for the kids to play, we can come look at the space and bat around ideas with you. Hardscaping and pavers are a common way to expand the usage of your yard, and it has the added benefit of cutting down your water bill. Trading in grass for decorative hardscaping, like brickwork, pavers, or decorative concrete allows for so much more potential. Think about the last time you actually walked through a gassy lawn (other than when you were working to maintain it or looking for deposits made by the dog). Lawns not only use up water, but also take time to maintain. Some people prefer a lush, green lawn, and that is a perfectly respectable choice. We are happy to install lasting, healthy lawns. 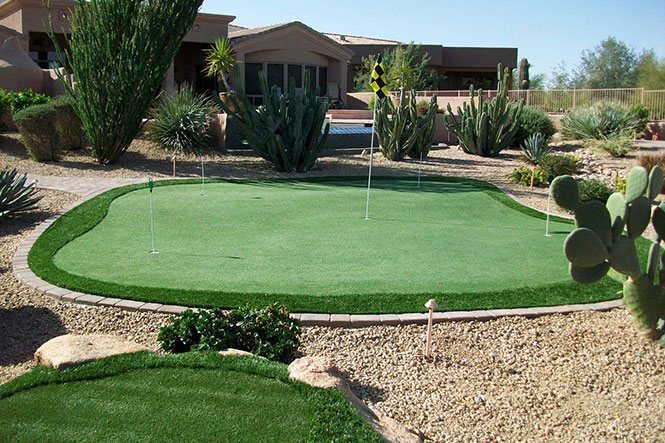 In fact, we can put in a putting green, if golf is what comes to mind when you think of a lawn. However, many people install a lawn because it is what comes to mind when they first consider landscaping. If you haven’t thought about it before, ask yourself what hobbies and/or activities you and your family could do in your outdoor spaces. 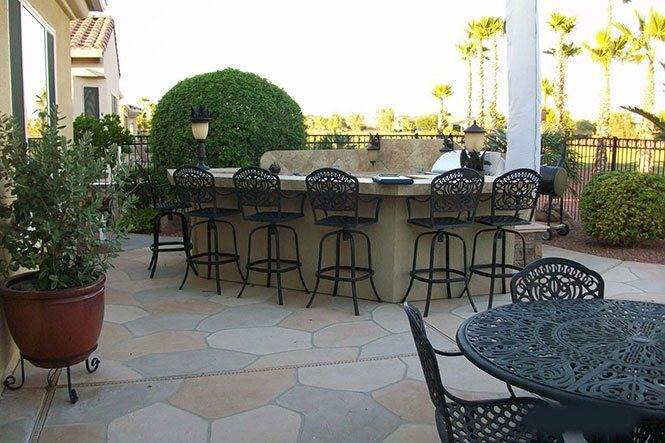 From installing shade structures and misters to creating a full-scale outdoor kitchen and dining area, we can create an outdoor space that does more than just look nice. We can actually get you outside! Think of the family time and increase in social ties that could come with a gorgeous, functional outdoor area where you can prepare meals and eat outside! Have friends over around dusk, for a drink around your fire feature when the weather cools down and the sunset is at its best. Create a community yoga routine where your immediate neighbors can join you for that extra bit of motivation you need to make it a daily habit. Get the kids off their electronic devices by creating an outdoor area with a mini basketball court, foursquare area, and tetherball pole. How about a porch turned into a craft space? What about an outdoor office space with a screened-in shade structure, built-in desk, and plenty of outlets? The options are only limited by our joint imaginations. Talk to us about what you enjoy. What would you do more of, if you only had the space? Get the expert help you’ve been looking for! Our in-house certified arborists and expert landscapers have the skills and knowledge your landscape needs. We can diagnose and treat both native and non-native trees and plants. With our pruning services your fruit bearing trees can even yield a larger crop! 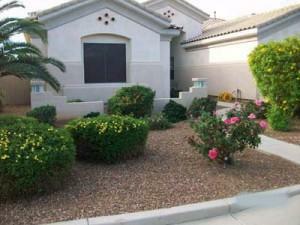 When you need specialized care from your landscaper in Phoenix, you can depend on our landscaping masters. The needs of our customers vary greatly. Sometimes entertaining is a deciding factor, and preferences can vary greatly. 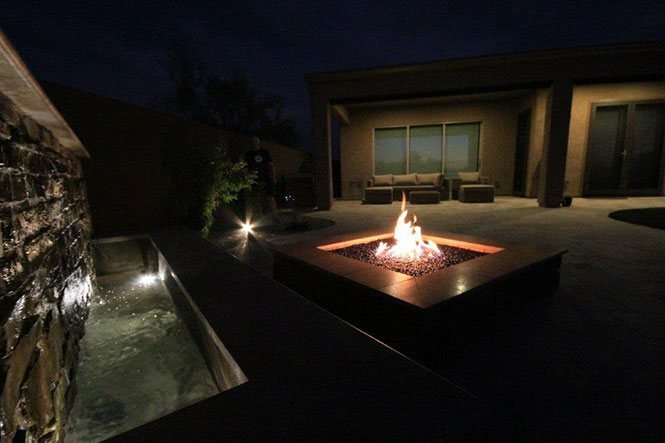 From gorgeous accent features like fountains and ponds to entertainment staples like fire-pits and outdoor kitchens, we do it all. Our pricing is affordable and competitive. This allows our customers to get more than they bargained for. Excelling at multiple services saves you from contracting multiple companies for your Phoenix landscaping needs. Our landscape maintenance services will continue the upkeep on your landscaping, ensuring your greenery has all it needs in order to thrive. Our lawn and plant care landscapers know everything from which fertilizers to use on what plants, to the optimal length to cut your grass during different seasons. We can install sprinkler systems designed for your specific plants and landscaping layout. When you need a landscaper in Phoenix and the surrounding areas, we’re the company with the best reputation and years worth of happy customers. We are the go-to place to call. A large number of customers find us through word-of-mouth referrals. That’s because we truly listen, and put your needs first. Talk to us about the outdoor oasis you have in mind, we can make it happen. We are valley-wide so make sure you have one of our landscape designers stop by for a FREE ESTIMATE today! Get started today by filling out the form above or giving us a call at (623) 780-0474 for a landscaper Phoenix area residents know and trust!